Poldark series 3 has confirmed the casting of Demelza Poldark’s (Eleanor Tomlinson) brothers- and Aidan Turner may have competition. Harry Richardson and Tom York are confirmed to be portraying Drake and Sam Carne in the third series of the hit period drama, which is currently filming. The popular drama is currently broadcasting its second series on Sunday nights. Richardson is best known for his role as Frank Gresham, the heir to the struggling Gresham family on the ITV drama Doctor Thorne. Meanwhile, York has appeared in one-episode stints of Agatha Raisin, Death in Paradise and Midsomer Murders, but is best known for portraying the lead role of Hero in short-lived fantasy series Olympus on Spike. Drake Carne is described as a “free spirit” with a lot of similarities to his feisty sister Demelza, while Sam is a more down-to-earth sort who wants to live simply and preach his methodist beliefs. 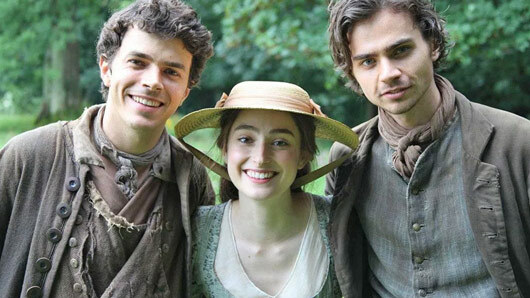 Ellise Chappell has also been confirmed for a role in the third series, playing Elizabeth’s cousin Morwenna. Morwenna is set to work as George Warleggan’s governess, but her attentions are soon driven far from work. Poldark writer Debbie Horsfield said: “We’re thrilled to be kicking off series three with a fantastic array of new characters and a story which scales new heights of conflict, feuding, passion and drama. Poldark airs on BBC One on Sundays at 9pm. The results of last night’s ratings battle have arrived… and it’s a surprising win for ITV’s Victoria. 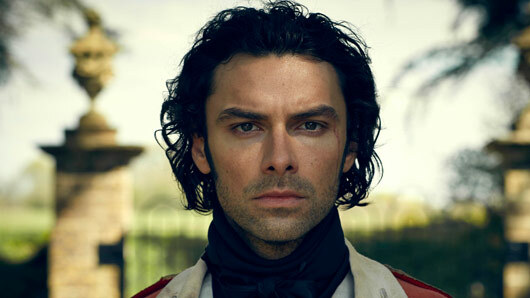 Onlookers have speculated on whether Victoria (ITV, 9pm, Sundays) or Poldark (BBC One, 9pm, Sundays) would attract the most viewers ever since Victoria‘s broadcast was announced to clash with the Aidan Turner-fronted period drama. The final result was extremely close. 5.3 million tuned in to watch Jenna Coleman’s Queen Victoria be turned down by first love Lord Melbourne (Rufus Sewell), while 5.1 million watched the aftermath of Ross Poldark’s arrest on BBC One instead. Meanwhile Aidan Turner had no such concerns. He said: “It makes a good story in the papers that we’re pitched against each other – but it really doesn’t feel like that at all. “You can watch Victoria live and then catch us on iPlayer – or vice versa. It’s just a different way of doing it now. I don’t think [scheduling] means what it used to mean a few years ago. 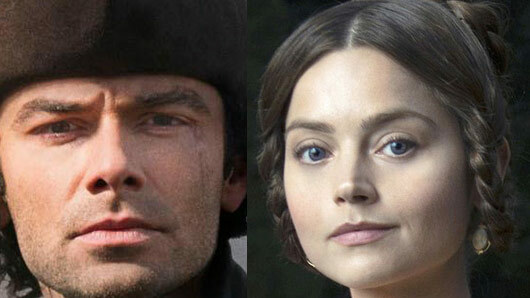 Victoria airs on ITV at 9pm on Sundays, while Poldark airs on BBC One on Sundays. Demelza Poldark actress Eleanor Tomlinson has teased a “rollercoaster” second series for Poldark. The last series of the drama ended with Ross Poldark (Aidan Turner) being wrongly arrested for wrecking and murder, shortly after his and Demelza’s daughter Julia died from putrid throat. Demelza Poldark actress Eleanor Tomlinson has teased a “rollercoaster” second series for Poldark. Speaking on This Morning ahead of the series’ return this Sunday, Tomlinson said: “Season two picks up where season one finished. We’re dealing with a loss of a child, Ross is going to be tried – who knows if he’s going to get off. The last series of the drama ended with Ross Poldark (Aidan Turner) being wrongly arrested for wrecking and murder, shortly after his and Demelza’s daughter Julia died from putrid throat. What we’re curious about however is how the love triangle between Ross, Demelza and Ross’ former fiancée Elizabeth is going to proceed. The second series of Poldark will adapt the story from Winston Graham’s third and fourth novels in the Poldark series, Jeremy Poldark and Warleggan. It is hoped the series can achieve the same popularity it achieved during its first series in March 2015, when it helped BBC One achieve its highest ratings share for the first quarter of the year in 10 years. Poldark series 2 airs Sunday at 9pm on BBC One. Poldark fans around the country nearly had heart attacks this morning after Aidan Turner suggested Ross Poldark might die this series. The sentence provoked uproar from listening fans, who mistook Turner’s words to mean he had filmed Poldark’s death scenes. Grimshaw was forced to ask Turner to clarify his statement, after receiving an outpouring of messages from devastated listeners. Fans can breathe a sigh of relief as they prepare for the eagerly-anticipated second series of Poldark, which will begin this Sunday at 9pm on BBC One. Aidan Turner is back and more intense than ever in the first trailer for Poldark season 2. “I fought for our liberty; for our hopes; for our dreams; and I’ll keep on fighting, whatever the cost”, pledges the highland hero, over images of his two lady loves Elizabeth and Demelza. Poldark is set to return to BBC One this autumn. How have you found the massive reaction to Poldark? AT: I don’t know, I haven’t really noticed. When you’re working, you’re working. We’ve been doing six-day weeks all the time, and you just kind of get caught up in that. Walking down the street sometimes I get stopped. Do you feel under pressure to maintain the physique you’ve become so famous for amongst the female public? AT: There’s an element of that, but I think I’ve finished all the slightly naked scenes I might be doing. I think they might all be done by this stage. Do you feel objectified at any point? AT: Not a bit. Never did. How often to female fans try to get you on a date? AT: It doesn’t happen very often! Which is not what I expected at all! What’s the mood been like on set after the success of the first series? AT: It’s always nice to go back to the show – I did it with Being Human where I’ve gone back in after a huge success and started on season two, and it’s always quite brilliant. It’s great. Do you think there’s a likelihood of further seasons at this stage? AT: I hope so, yeah, it would be nice, but we need to keep the standard high. If the standard keeps the way it is, we keep doing it. If it drops, we’re off, like everything else. Can you tell us what you might be doing next? AT: I don’t know! I’m going to travel for a bit. I’ve been working back to back on jobs for years now, but yeah, I don’t know. You mentioned Being Human, which aired on BBC Three. What do you think about the channel’s upcoming move to online? AT: I didn’t know that… I seem to be out of the loop for everything, I had no idea. That’s quite sad. Danny Cohen is fantastic and he was pioneering that network for a long time, and I hope it does well. It’s a great network. How has your family reacted to your rise to fame? AT: Mum’s proud! She’s dead proud, she’s proud of everything I do. I’ve never really asked her though, like ‘what do you think of this?’. She’s just proud of her boy, you know. AT: I don’t know, where’s a good place for a trophy? Is it a bathroom job? Yeah, that says it all, doesn’t it? !